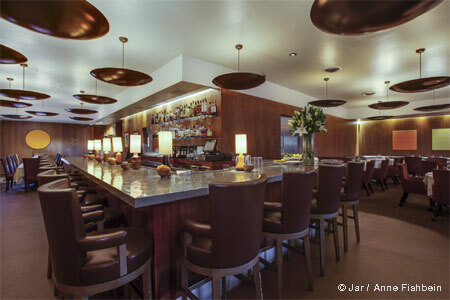 This hidden restaurant in Century City features creative and delicate Asian-inspired cuisine. 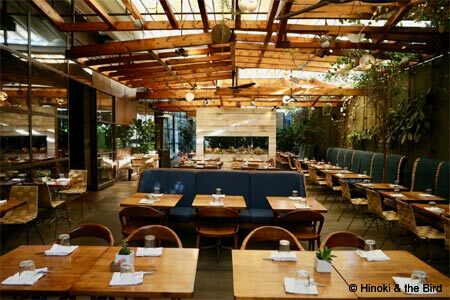 : Hinoki & the Bird may be hidden away in The Century luxury condominium building in Century City, but that hasn't hindered diners from descending upon this restaurant. The space encompasses a sizeable main dining room with a bar on one side and open kitchen on the other, plus a patio with retractable roof. By nature of the design materials --- wood, glass, cement --- the room can get very noisy. Creativity and inspiration are certainly present on the Asian-inspired menu executed by Brandon Kida. The lobster roll is given a twist both visually and gustatorily with the bun turned black from charcoal powder and the filling enhanced with green curry and Thai basil. Try the signature black cod, which arrived perfectly cooked and covered with a still-smoldering sheet of hinoki (the Japanese cypress for which the restaurant is partially named) to impart a delicate scent to the dish. For dessert you'll find mochi ice cream in flavors like miso or black sesame. As at most trendy restaurants these days, there's an emphasis on cocktails.